K.A. Laity draws the reader into this book with a compelling sentence on the first page: "But it is the beginning of this story, so of course something terrible is going to happen." Laity bases her story on the Grimm Brothers' fairy tale Allerleirau, in which a princess must flee her kingdom after her grief-stricken father de­clares she must marry him because she so re­sembles her beautiful late mother. One can hardly blame the princess for taking flight, but she is not alone—she is aided and abet­ted throughout the tale by her centuries-old caregiver, Nanna. The narrative unfolds from the point of view of Nanna, who is an Irish witch. 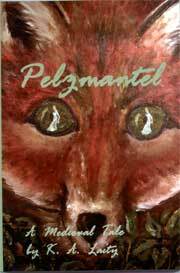 She shapeshifts into a fox to escape the kingdom herself and to accompany the princess Hallgerd on her journey. Various magickal practices are described through­out the book, which is set in medieval Scandinavia. Nanna uses herbs to astrally project and spy on the palace she has left behind, and thus discovers that the evil mage Thomas has trapped the soul of the princess' father in a vessel, thus leading lo the confused state of mind that prompted his proposal of marriage to his daughter. Naturally, it's up to Hallgerd and Nanna to reclaim the kingdom from the sinister clutches of Thomas. However, an ancient curse prevents the women of Nanna's line from using magick against the men of Thomas' line. Meanwhile, a romance is hinted al with the young king of a neighboring land. What follows is an engaging read from a writer who, as a Ph.D. candidate in Medieval studies and a Pagan herself, knows her stuff. It is also interesting that the author uses the present tense, taking the story away from "once upon a time" to the here-and-now. And, by the way, the publisher. Spilled Candy Books, has a great web site filled with other books of a Pagan nature. Check it out at www.spilledcandy.com.